The BB 12061 Trix (ref. 22361, era III, blue “monophasé” livery) is equipped with a recent PCB (SMD components and LEDs), but the red lights are wired in parallel with the white lights. It is therefore impossible to turn off the red lights when the machine pulls a train. I also plan to equip it with a Lenz Silver decoder. No special problem, except that it is necessary to remove the cab handles (the most difficult will be to reassemble without scratching the paint). First, you unscrew the end bonnets (three screws under the chassis, two near the cab and one at the “nose” end). Once these bonnets are removed, the cab can be easily removed. About the bonnets, it seems to me, from the many photos I’ve seen, that they’re reversed from reality. Indeed, they are asymmetrical by the “cheek” gills, and these gills should be on the side of the “BB 12061” lateral marking and not that of “SNCF”. I wondered if it was a random error, but the box picture reproduces the same error. Fortunately, the bonnets can be swapped without difficulty. This seems all right, but then the transformer tray (between the bogies) is not in the right direction! In fact, it would be necessary to swap… the markings. 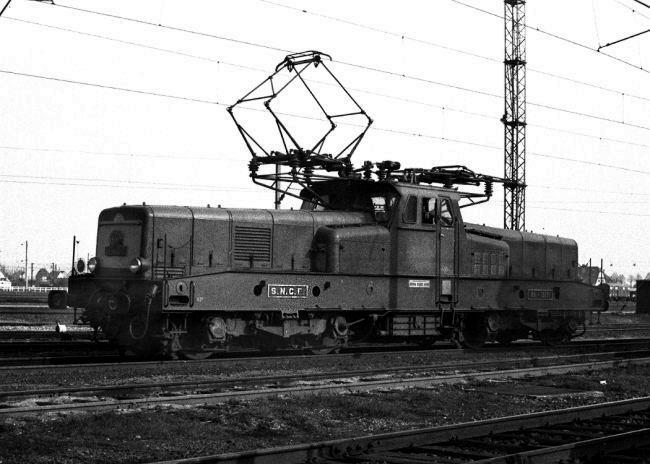 See on this subject this Ray Soper’s photo on RailFanEurope. Where to put the decoder? I always try to avoid the easy way of installing the decoder in the cab. Moreover, this one is already filled up to the level of the windows. There is, under the bonnet opposite the PCB, a plastic plate that seems intended to be exchanged with a decoder. There are two screws and two centring pins, respectively arranged diagonally. But the spacing is probably specific to a Trix decoder. So, I removed this plate, cut the pin indicated in no.3, and fixed my Lenz Silver with a single screw (no.2). Pin no.1 is left intact. Initially, I had just stuck the decoder on the plastic plate, but it was so tight under the bonnet that a component marking was printed in the black adhesive stuck under it!